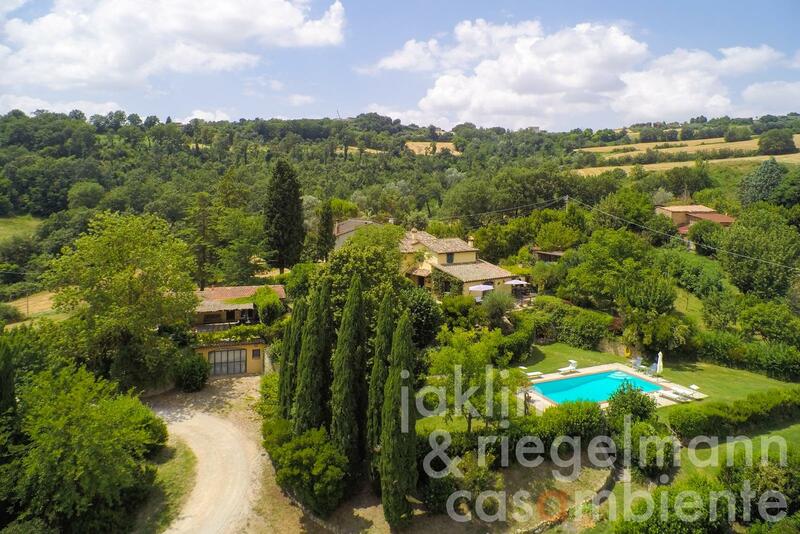 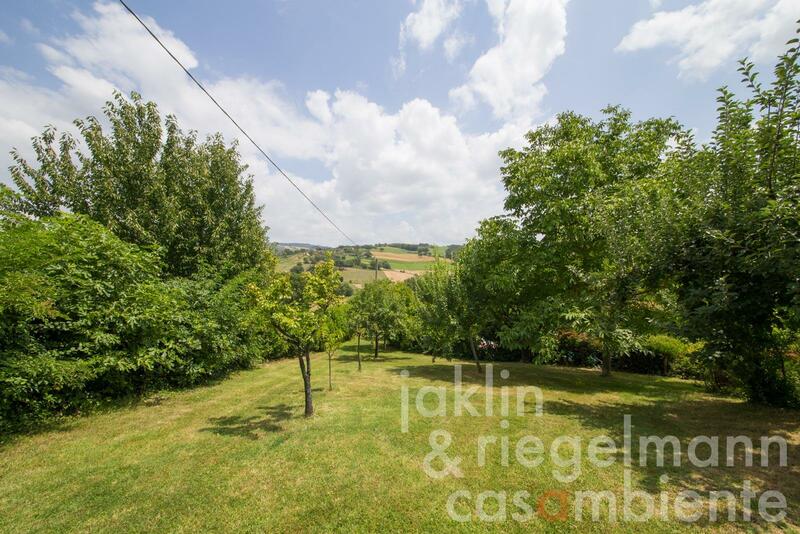 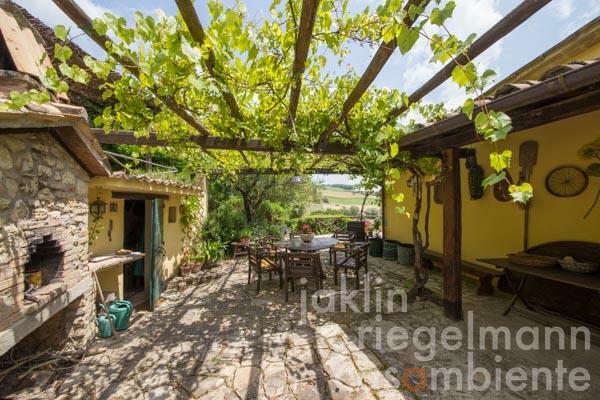 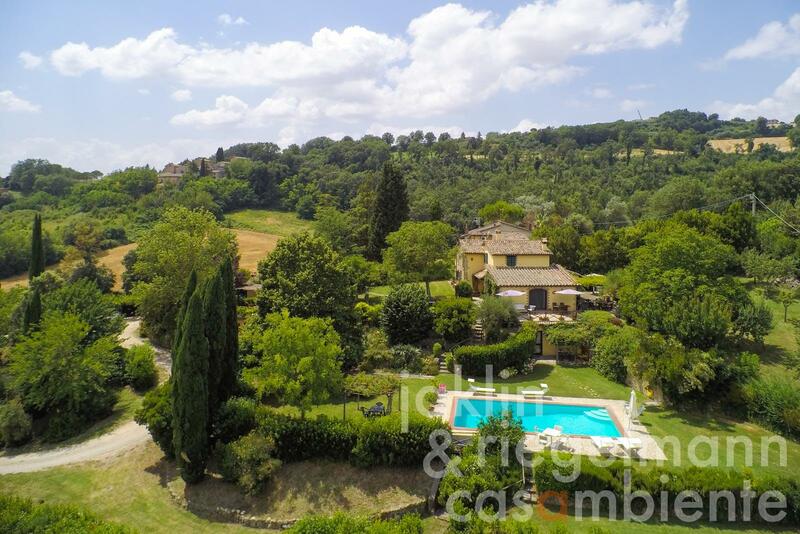 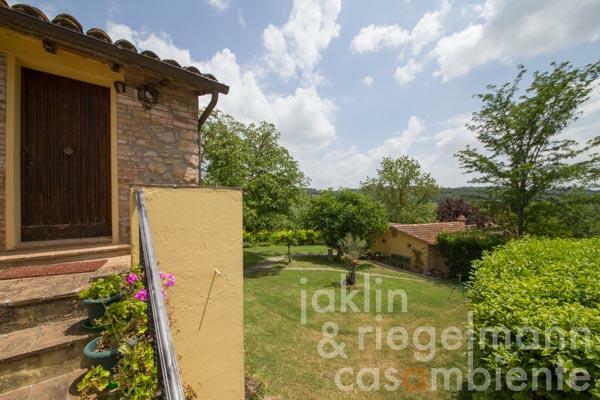 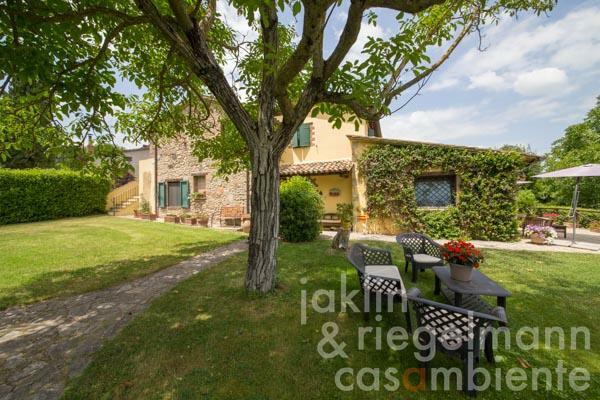 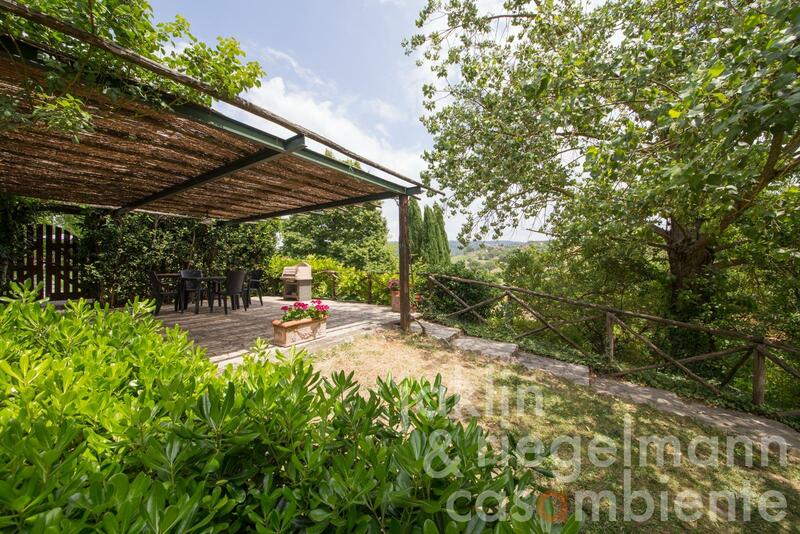 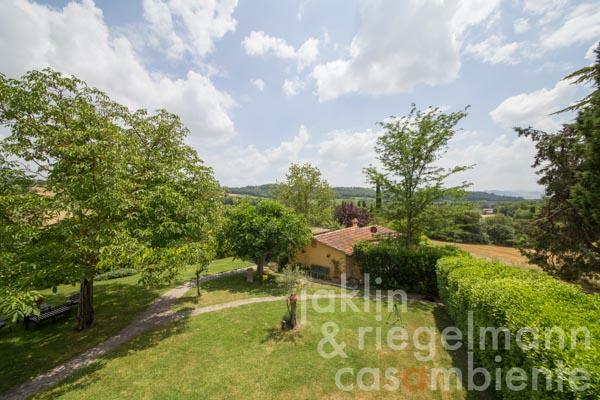 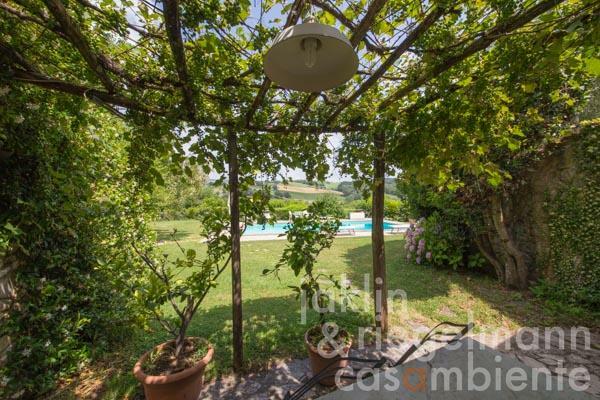 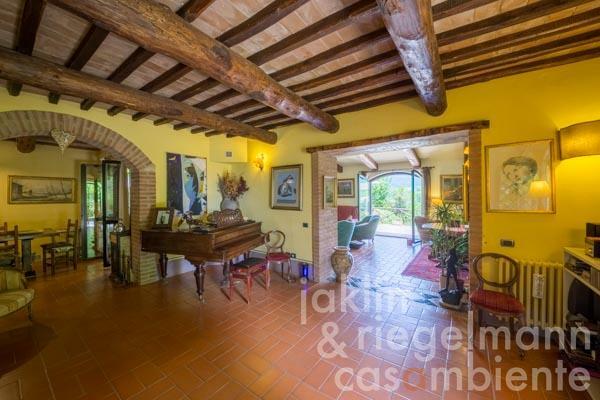 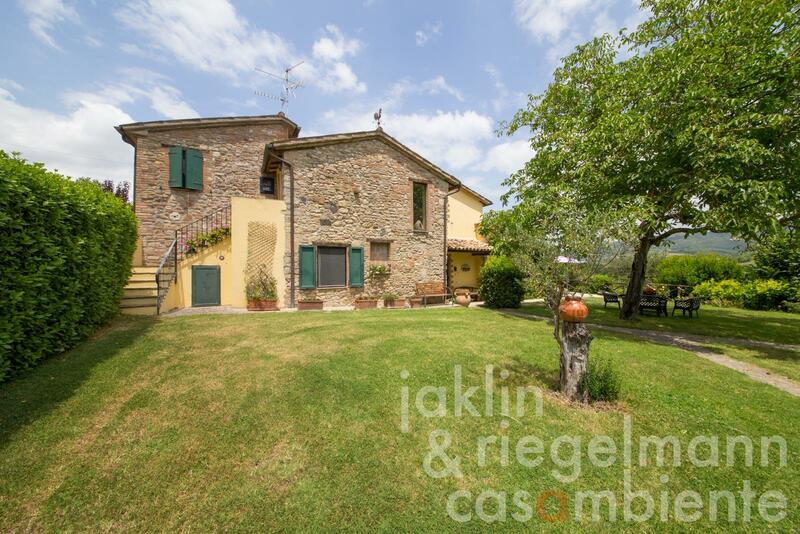 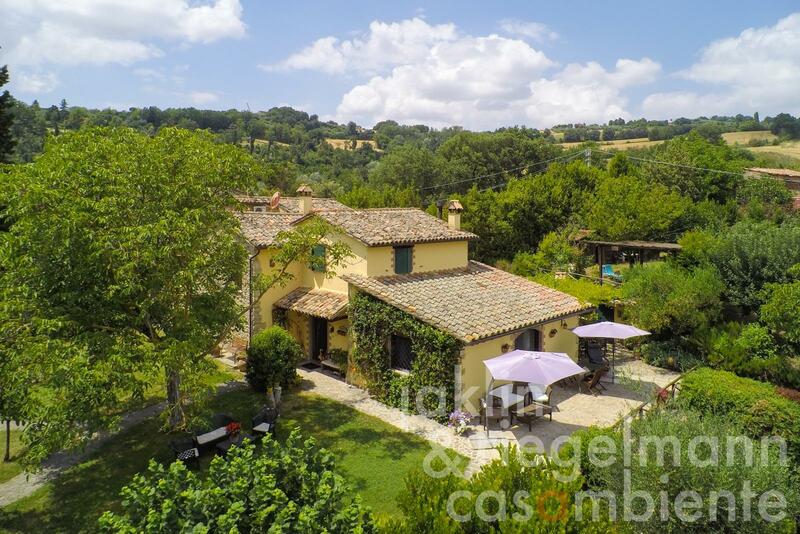 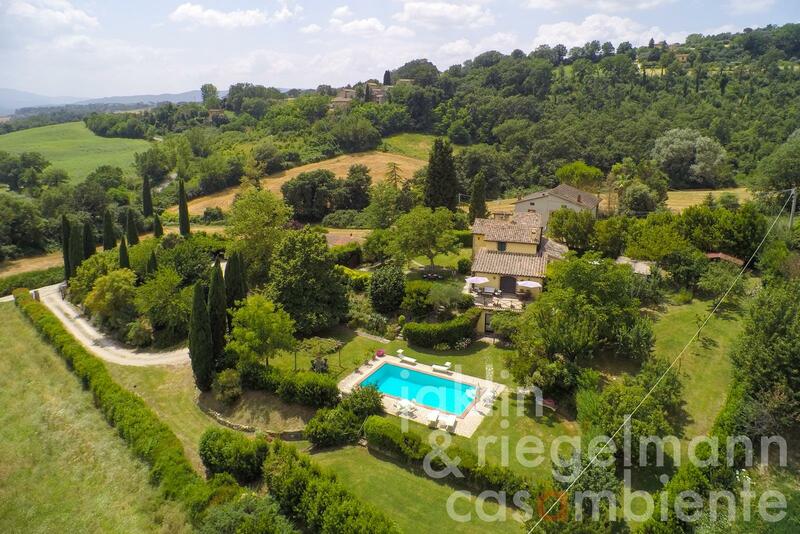 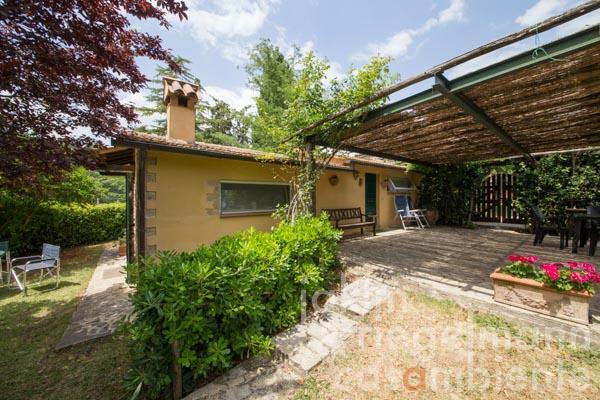 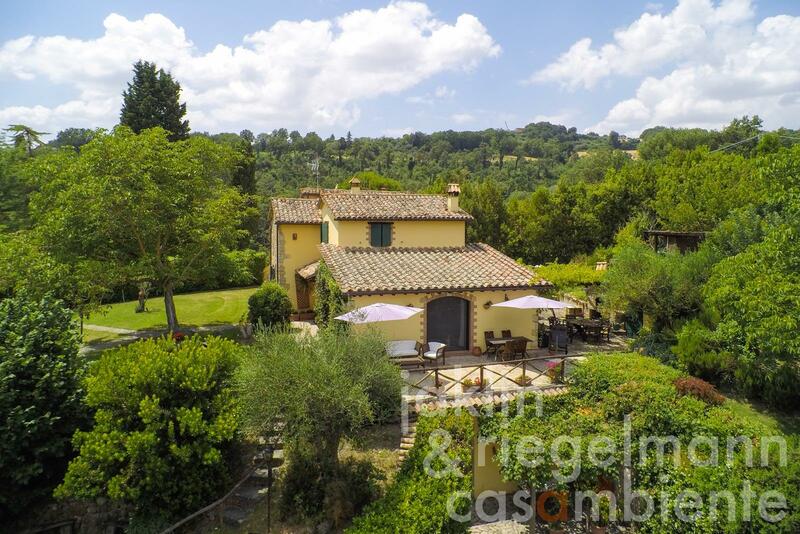 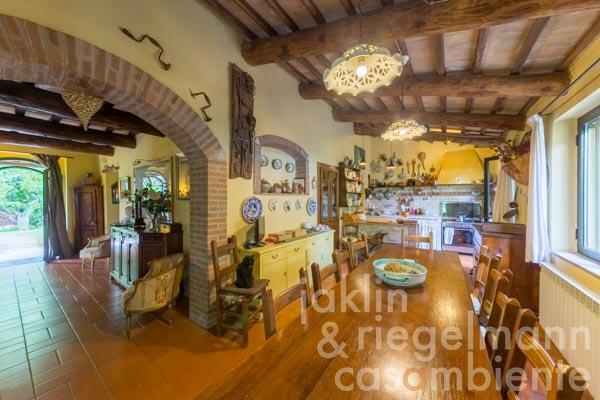 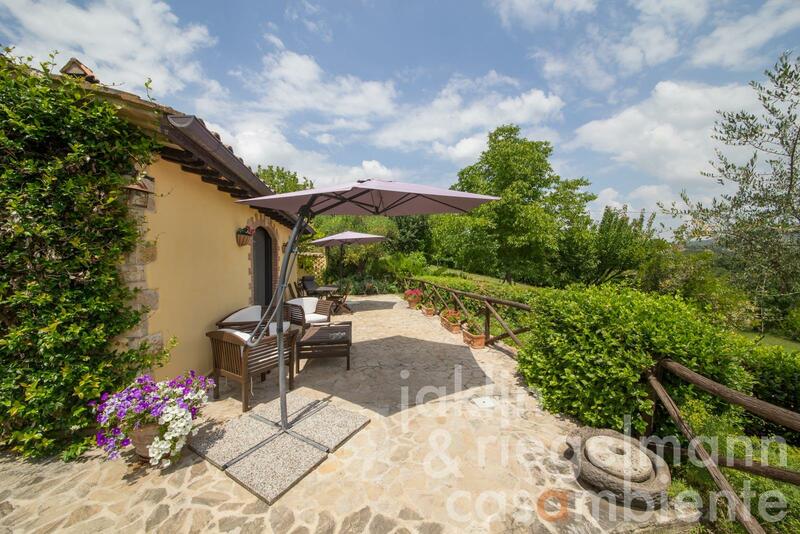 This beautiful stone and plaster farmhouse for sale is set in the most charming location, with beautiful views of the countryside surrounding the towns of Todi and up to San Terenziano and Grutti in Umbria. The property consists of a main building (approx. 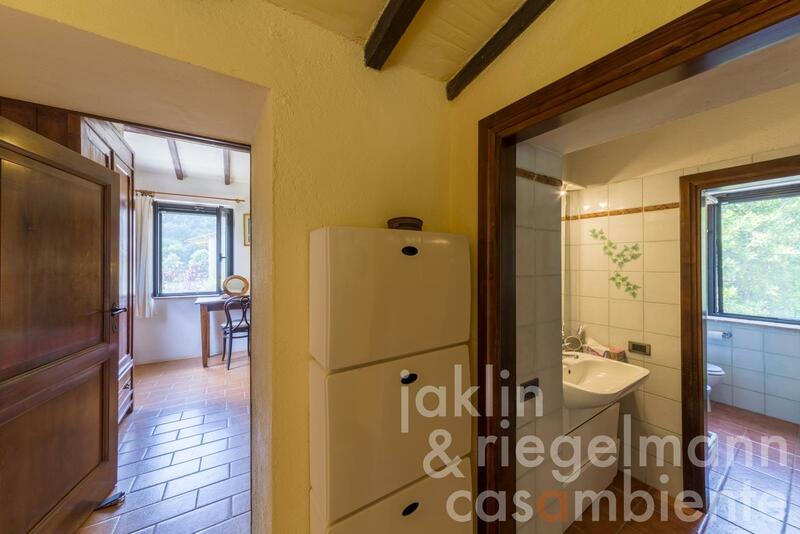 300 m²), a guest apartment (approx. 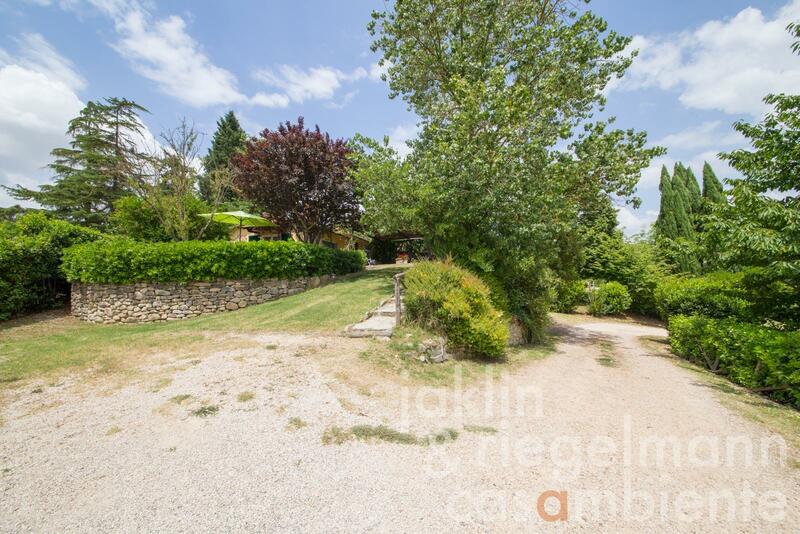 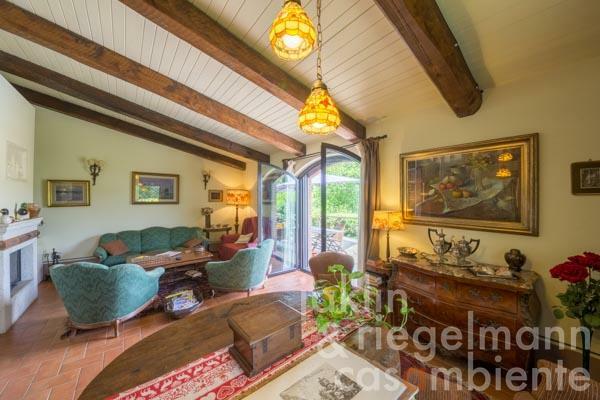 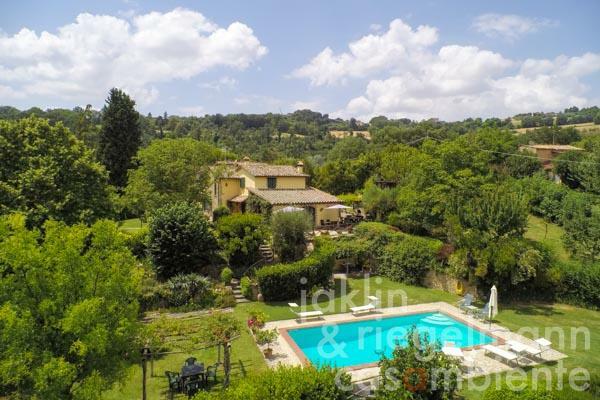 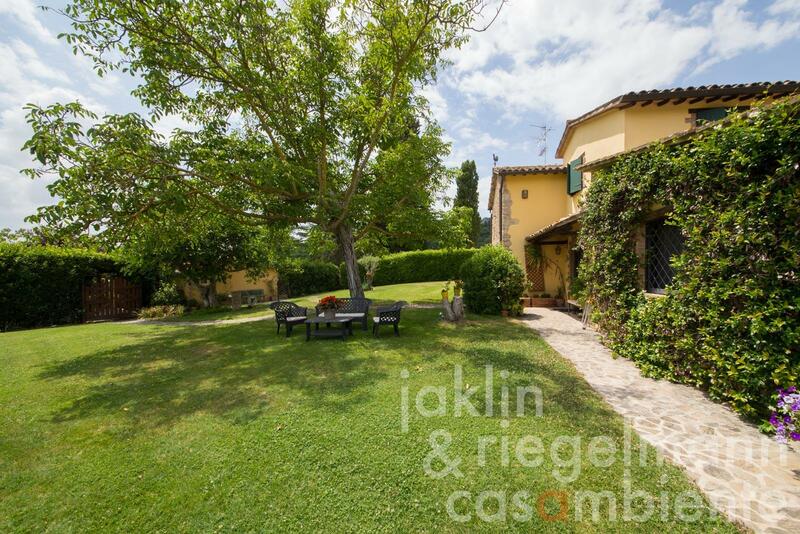 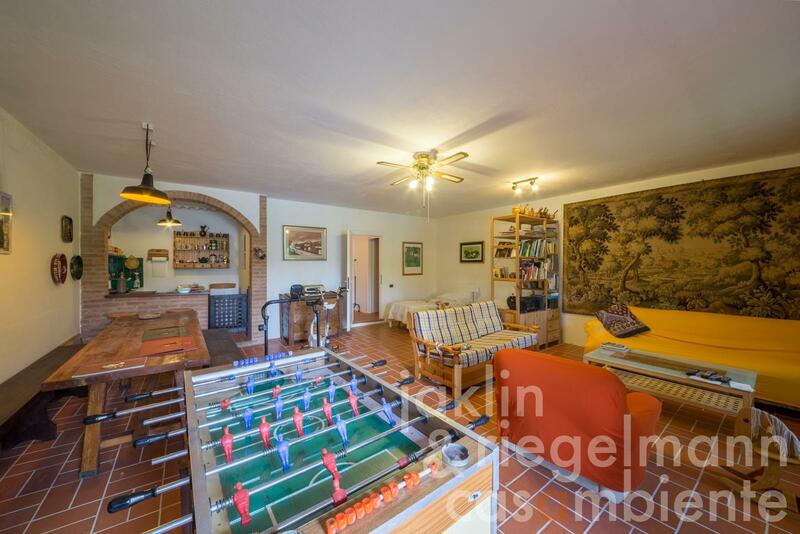 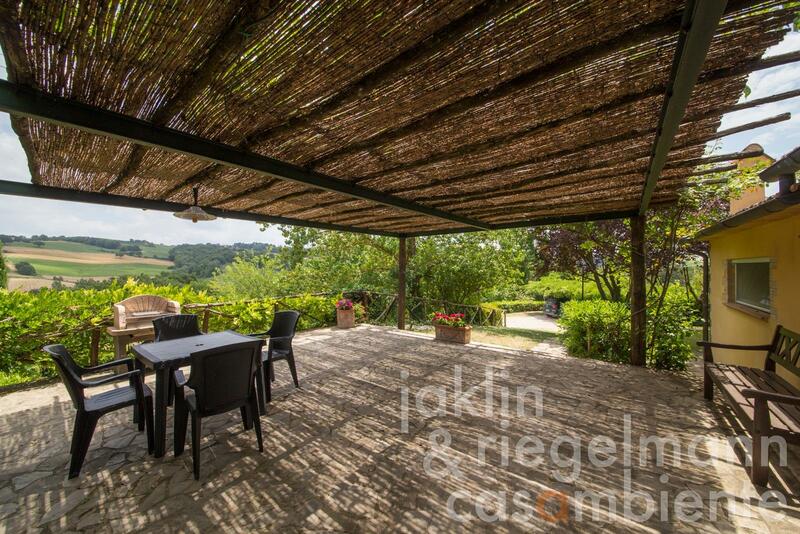 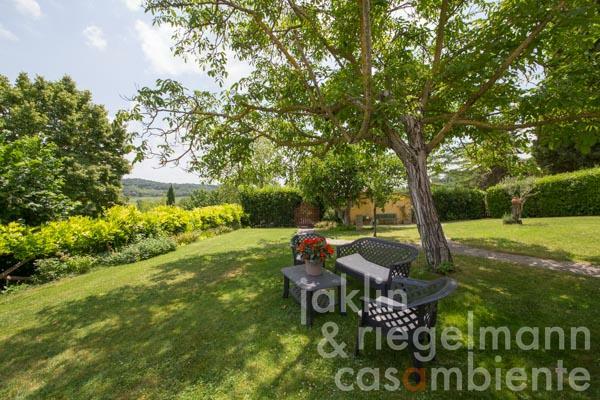 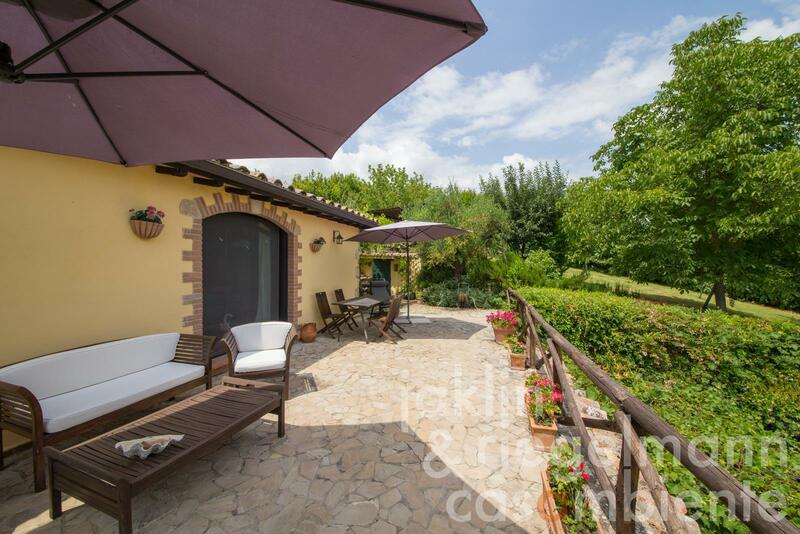 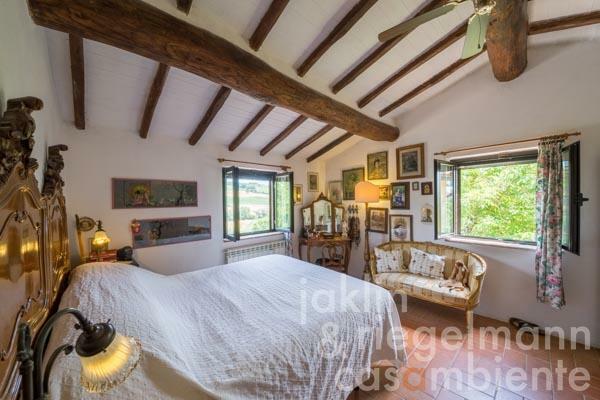 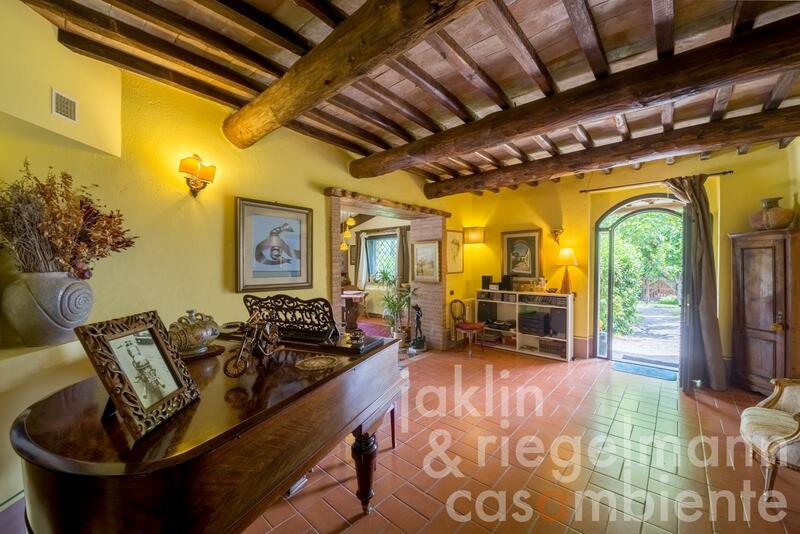 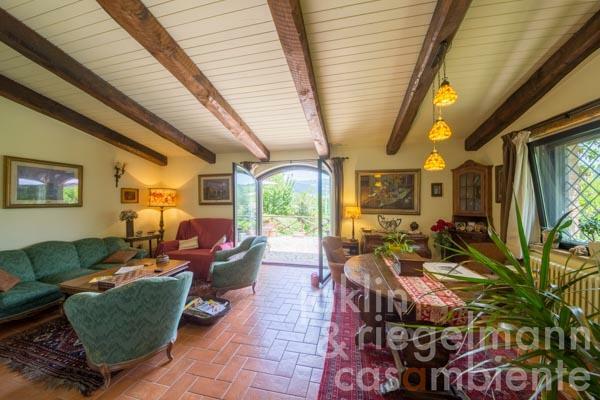 55 m²), a pool, a garage and several outbuildings/stables, all surrounded by a fenced garden of about 3,700 m². 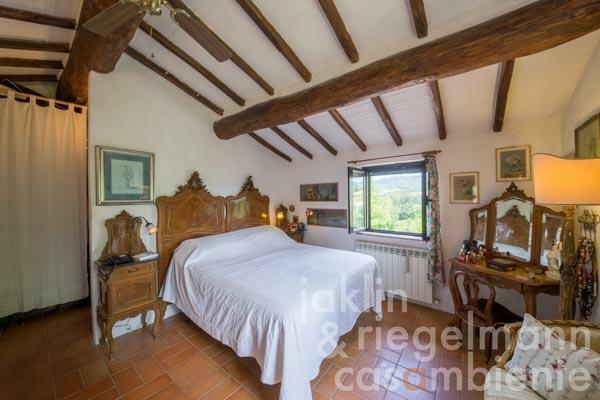 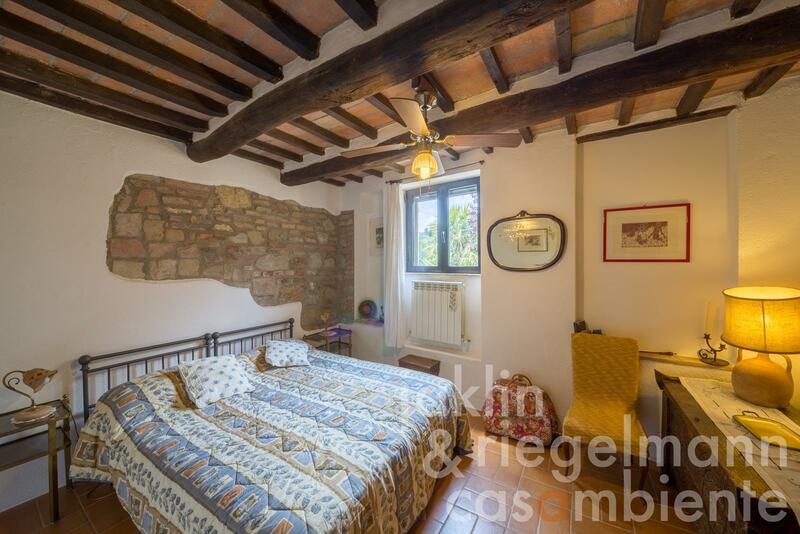 The houses were lovingly restored in 2008 using quality materials and maintaining the original typical Umbrian style with old stone roof tiles, beamed ceilings, exposed stone walls, iron grating, and wooden shutters. 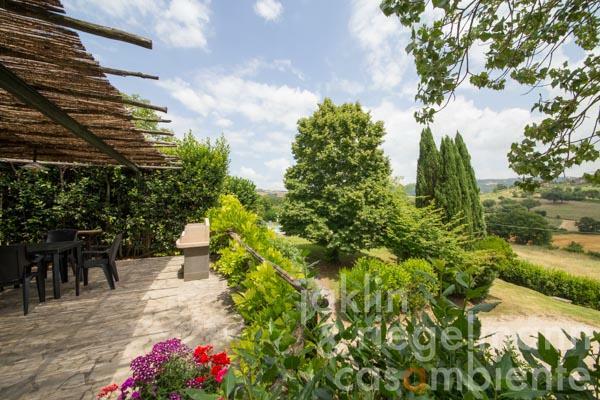 The Mediterranean style garden is particularly rich in mature trees offering many shaded areas, and plants of lavender, rosemary, a variety of roses, olives and fruit trees. 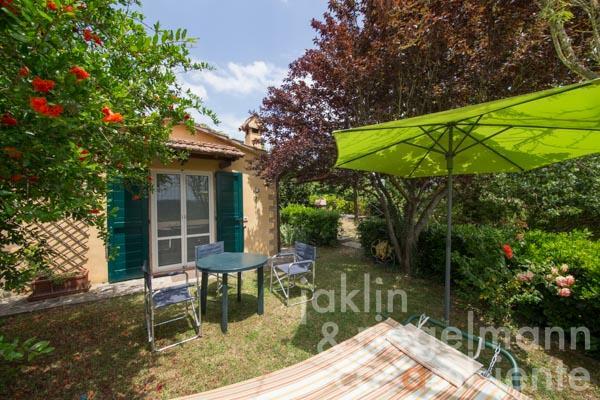 The area around the house is surrounded by a beautifully well-kept lawn with irrigation system and a vine covered terrace with barbecue area, ideal for al fresco dining. 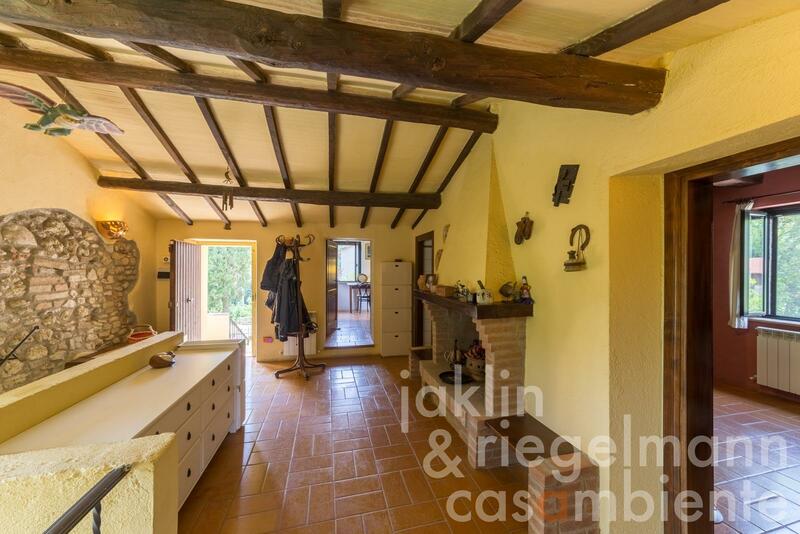 The main house offers on the ground floor a large entrance hall, lounge with fireplace, fitted eat-in kitchen with pantry/boiler room and access to the pergola covered terrace and BBQ area, bedroom, bathroom, storage room used as bedroom, and a storage room under the stairs. 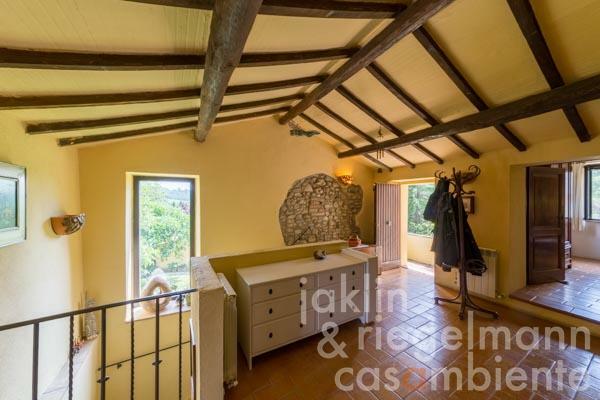 The first floor (reached by internal as well as external staircase) has a sitting room with fireplace, two bedrooms, bathroom, master bedroom with ensuite bathroom and air-conditioning. 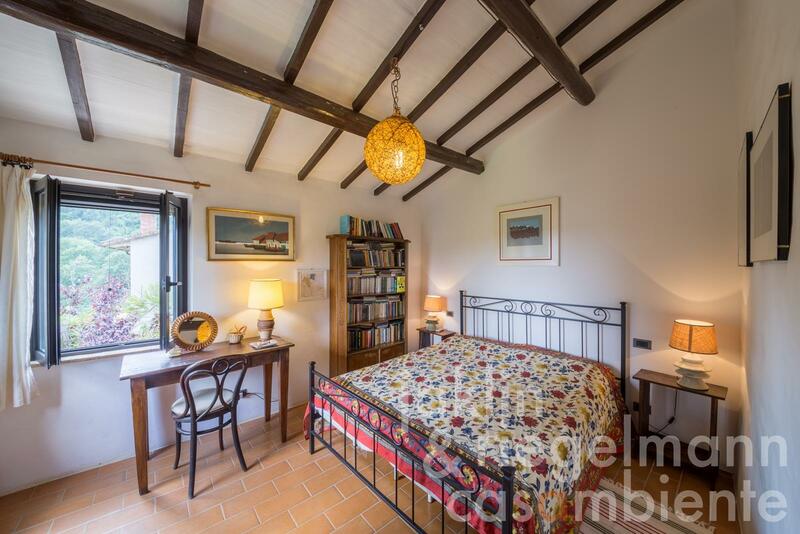 The guest house comprises a living room with kitchen corner and wood-burning stove, bedroom, bathroom, and a pergola covered terrace. The garage is currently used as an art studio. The cantina/pool house has a large open space used as games room with kitchen corner, storage, and a bathroom. 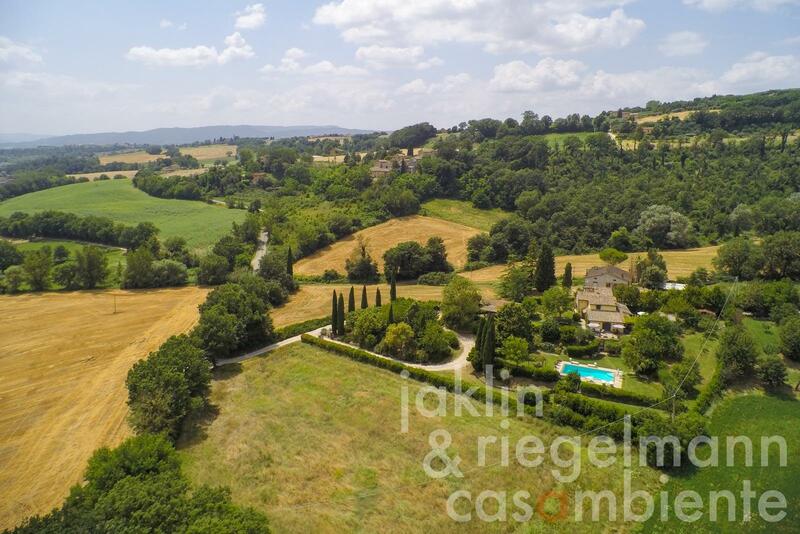 Distances: Restaurant 2 km, San Terenziano (most amenities) 5 km, Pantalla (all amenities) 6 km, Todi 8 km, Bevagna, Montefalco 24 km, Perugia 35 km, Spoleto 39 km, Orvieto 45 km, Rome 127 km, Florence 183 km. Airports: Perugia 40 km, Ancona 147 km, Rome 168 km, Florence 204 km. 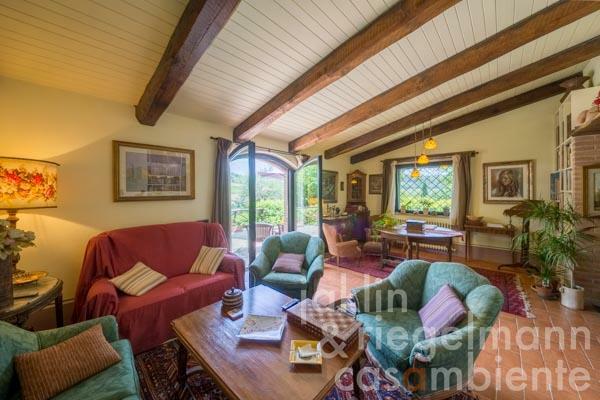 Electricity, mains water, central heating, fireplace, air conditioning, gas tank, broadband internet access, satellite-TV, automatic gate, irrigation system, swimming pool, garage, carport, terrace, garden.